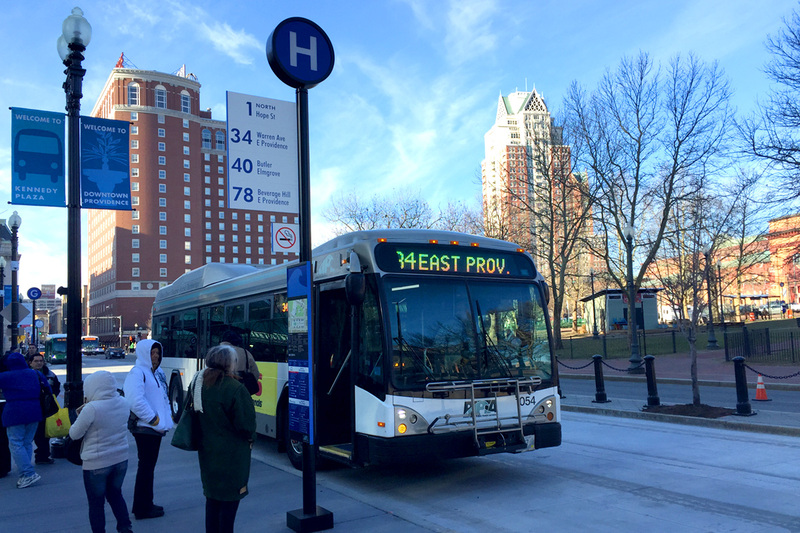 The Rhode Island Public Transit Authority (RIPTA) and the City of Providence are hosting a community meeting to provide an initial overview of plans for a high-frequency transit corridor in downtown Providence. The meeting is also intended to solicit ideas and public input on the project. The transit corridor will connect the Providence Amtrak/MBTA Station and the Hospital District with high-frequency bus service. The meeting will be held from 5:00pm to 6:30pm on Tuesday, December 6, 2016, at the Joseph Doorley Municipal Building (1st Floor), located at 444 Westminster Street in Providence. The corridor, which has the working name of the Downtown Transit Connector (DTC), will create six “station-like” stops between Providence Station and the Hospital District. These stops will be designed with a unique and highly-visible identity and will include bus shelters, real time information bus arrival signage, bike share stations and other passenger amenities. The project will strive to create attractive public spaces around each stop. The $17 million project is funded by a grant from the U.S. Department of Transportation’s Transportation Investments Generating Economic Recovery (TIGER) program, with matching local funds. Part of the grant funding will be used by RIPTA to purchase vehicles to operate the service. Construction is anticipated to begin in 2018 and be completed in early 2019. Higher levels of RIPTA service may begin even before construction is complete. Community meetings such as these allow RIPTA to present proposed plans, as well as to collect valuable feedback from the public. Please attend the meeting, or visit to learn more as this project advances towards construction. RIPTA will provide translation services and interpreter services for the deaf and hearing impaired, provided such a request is made at least 72 hours prior to the scheduled meeting date. A request for this service can be made in writing or by calling (401) 784-9500, x209. Full Disclosure: I have been invited to sit on an Urban Design Framework Committee which will be meeting several times over the coming months to give input on the design of this project. Will the buses look different? Will they be free? If they will not be free, this project is doomed to failure. Eliminating the streetcar was a terrible idea. As an example to answer your question, Port Authority Transit in Pittsburgh, PA has a free downtown zone and has had for decades. They have no specific hub, as we have with KP, so the entire downtown functions as a hub as various buses cross, loop and terminate/begin within the downtown zone. New Haven has a free weekday shuttle that loops through downtown and connects major parking lots/garages, Union Station: Amtrak/Acela/CT Shoreline East/MetroNorth, and area businesses. Within the loop is Yale University, Yale-New Haven Hospital, and Gateway Community College. The shuttle is provided by CTtransit, the public fleet owned by the Connecticut DOT. I am not sure how this is funded..
Denver, also having a train station at its periphery, also has a free bus route that goes from the train station thru the downtown core to the civic center area. I was told Hartford CT has something similar. I’ve been advocating that with $17 million to play with, RIPTA do something similar as at $2/ride, jazzing up some bus stops on that route that mostly can be walked is unlikely to generate much in the way of new passengers or new business investment from entrepreneurs interested in a transit friendly environment. But a free loop might get some new riders to give RIPTA a try and generate some excitement for the downtown. I did wrote to RIPTA, RIDOT, the Downtown Improvement District, the Mayor’s and Planning Department’s offices in the city, and the RIPTA Riders Alliance about this, didn’t detect that any of them were much interested in the idea.